During this season of giving, the Port Townsend Marine Science Center is celebrating the connection between marine animals and humans, and the power of these amazing ambassadors to inspire tens of thousands of people each year to become stewards of the Salish Sea. Please consider gifting others with this connection by making a donation to the PTMSC -- -- Thank you! 2018 was a big year for some baby sea snails with personality. It marked the inception of the Abalone Project at the Port Townsend Marine Science Center. Juvenile pinto abalone in the Conservation Lab nursery in the Aquarium. Staff photo. With planning and coordinating support from the Puget Sound Restoration Fund (PSRF), the goal of the larger pinto abalone recovery program involves *government agencies, businesses, nonprofits and citizens determined to restore pinto abalone to a population density that can be self-sustaining. The start of the Abalone Project coincided perfectly with the unveiling of the new PTMSC Conservation Lab, both of which were funded by an ALEA grant from the Washington Department of Fish & Wildlife. Housed within the Aquarium, the lab was constructed while the facility was closed for the season and the Abalone Project is its first effort. Juvenile abalone arrived in April 2018. From left, PTMSC Aquarist Ali Redman, volunteer Dana Africa, and Josh Bouma of the Puget Sound Restoration Fund. Staff photo. 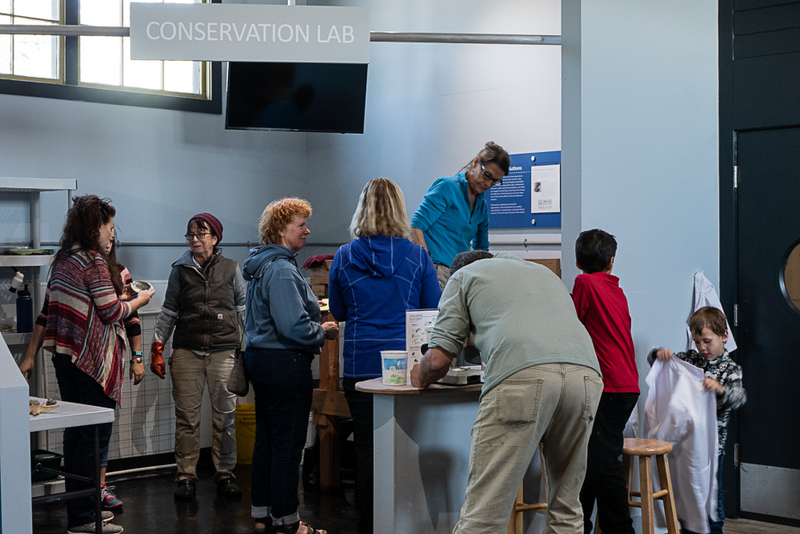 The broader purpose of the Conservation Lab -- completed in time for the annual Aquarium re-opening in April 2018 -- is to highlight efforts to conserve the Salish Sea, functioning both as a citizen science area and a public exhibit. Introducing visitors to this wonderful and often unfamiliar marine animal, a rather charismatic mollusk! Volunteers prepare the Abalone Project for public display. The first juvenile pinto abalone were transferred to the Conservation Lab on May 22. Aquarium visitors immediately notice the breeding tanks and, with the help of docents, soon realize the tanks are teeming with baby abalone. Many of these people would probably not have heard about efforts to save the pinto abalone without this new PTMSC exhibit. The plan is for the current cohort of abalone to be released in Spring 2019. By that time, they will have grown to the size of a nickel or even a quarter. Numerous people have been involved in the Abalone Project, overseen and directed by Aquarist Ali Redman, Citizen Science Coordinator Betsy Carlson and Facilities Coordinator Phil Dinsmore. Over the winter, volunteers constructed the breeding tank frames and assisted with the building of the Conservation Lab. 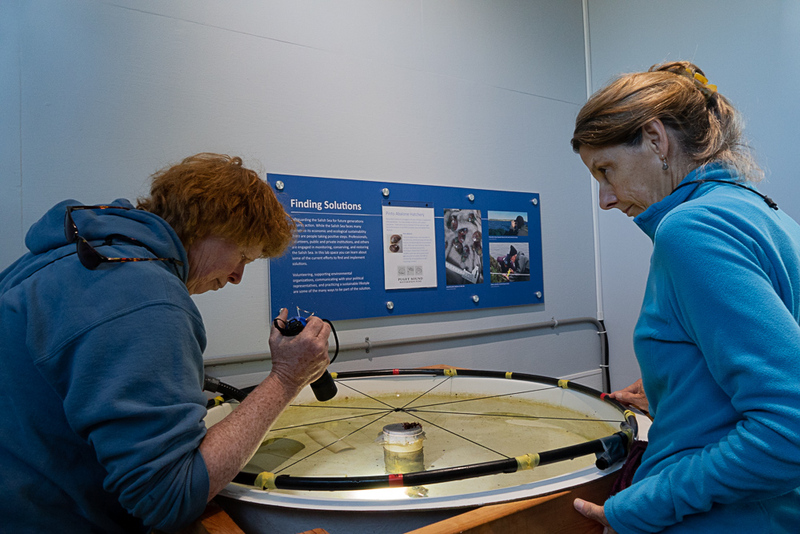 PTMSC volunteers Sue Long (l) and Lee Merrill (r) examine the abalone tanks. 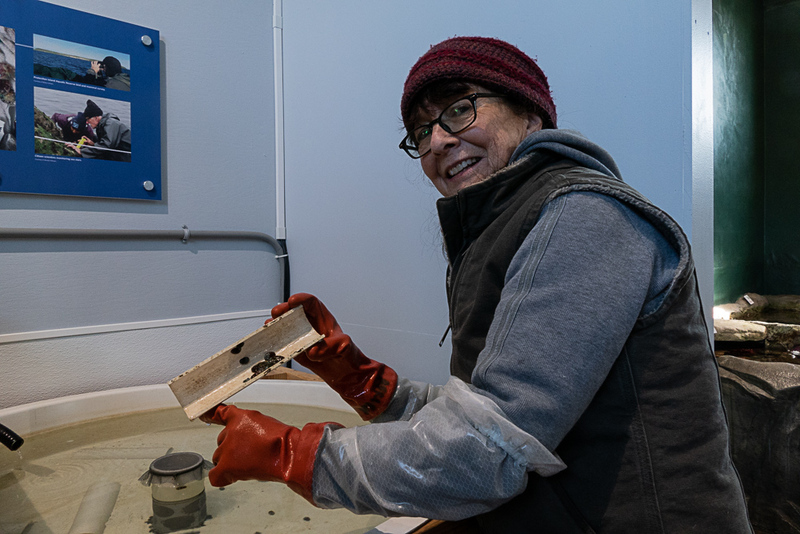 Once operational, additional volunteers assist with the twice-weekly tank cleaning, while others conduct monthly abalone counts and shell length measurements. All of the Aquarium docents, as well current and former AmeriCorps members, have played a vital role in interpreting the exhibit for visitors. Because the Conservation Lab is essentially a satellite PSRF hatchery, the pinto abalone that are bred and raised the PTMSC Abalone Project represent a very small portion of the larger PSRF project. But the impact of the project cannot be under-estimated, because PTMSC has a unique ability to provide outreach and public education. Recently, the Washington Department of Fish and Wildlife proposed adding pinto abalone to the state’s endangered species list. The recent meetings are described here and in this news article published by the Port Townsend Leader on Nov. 20. The PTMSC will continue working with the PSRF and will likely raise pinto abalone again next year, and hopefully in the years beyond. Volunteer Dana Africa shows off the abalone young-'uns! Stop by when the Aquarium re-opens over the holidays and meet the Pinto Kids!